Silk like over its bed of rocks. Running homewards against the flow. It’s been so dry in this part of Scotland over the spring and summer that the rivers have all been running very low. 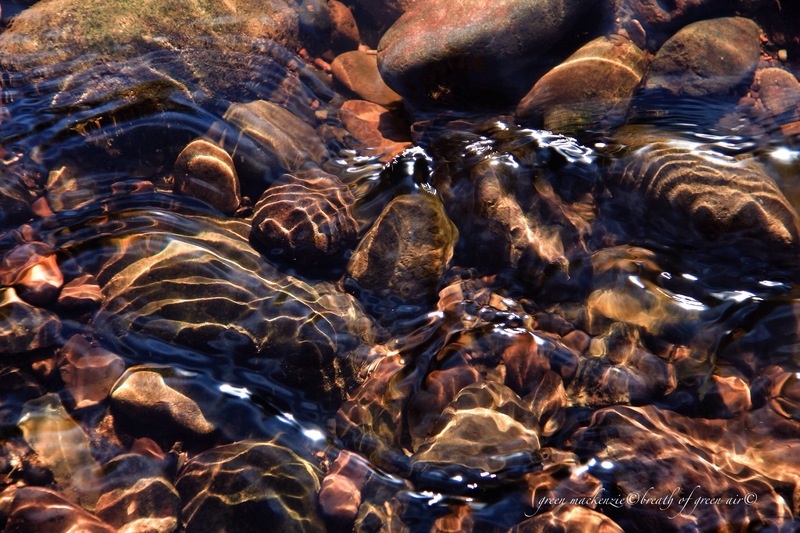 Reduced to silvery trickles over the smooth stones of the river beds. The salmon and trout returning to run up river to the spawning pools have been stuck in the estuaries, biding their time. 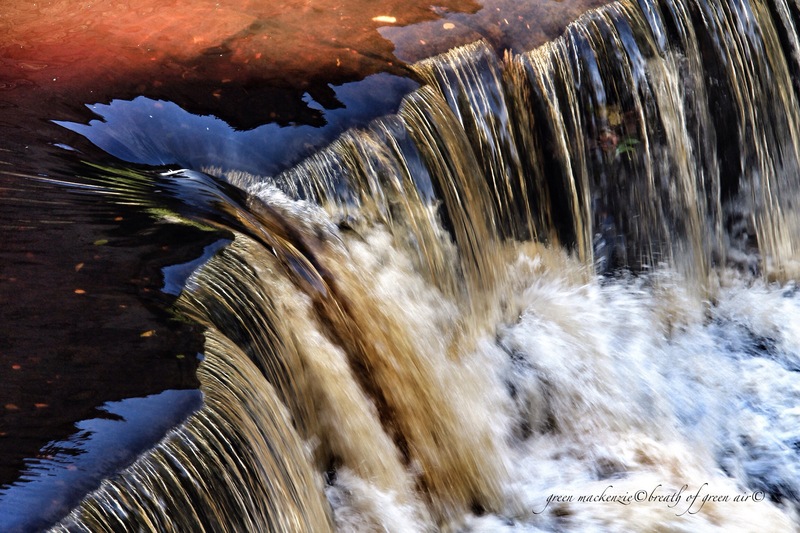 Now that the rain has come, the rivers have swollen, and the fish are running in waves up the waterfalls and weirs. We watched as fish after fish threw themselves up out of the water, leaping again and again, falling back onto the rocks exhausted. Herons had gathered like vultures looking for an easy meal. It’s an amazing spectacle, and of course I didn’t catch a shot of my best sighting. A huge pink and copper male leaped right out of the river, standing on his own tail, nose skywards a few yards from the bank. He seemed to stand still, his black eye full of tales of the deep ocean, he looked right through me before falling back with a dramatic silver splash. To keep trying seems to be the lesson of the salmon. To persevere despite the highest obstacles. This entry was posted in Celtic, nature photo, poem and tagged Autumn, Celtic, nature, photography, poetry, rivers, salmon, scotland, spawning. Bookmark the permalink. No need for a shot of the magical salmon as your description was so vivid and lovely, Seonaid. Your words take us there – again wonderfully come together! Thanks Scott….it took me a while, and a great many missed shots! yes but when you get it right – that equals satisfaction. Fingers of the river … Bow. 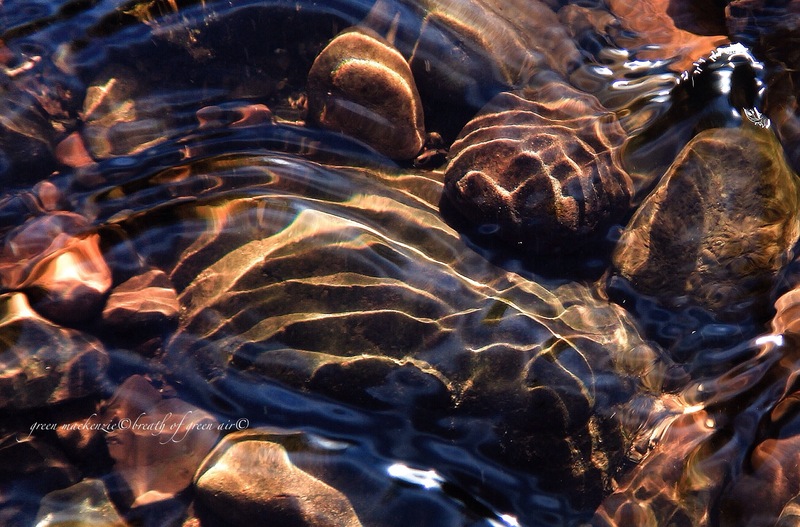 Very nice images of the water and the rocks. You described your “best sighting” so well, painting the picture in words, that you don’t need a photo for it. Gorgeous post. Rich with color and verse. 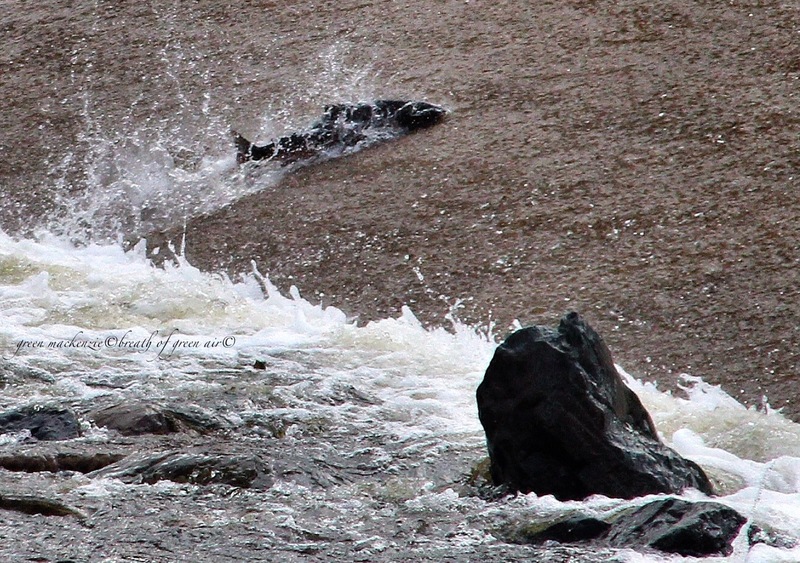 What a spectacular sight it must be, to watch the salmon returning. What a beautiful post altogether, Seonaid – those colours on the water are amazing. And the whole post has such wonderful light. You must have been thrilled to capture that salmon, even if you missed getting a shot of that great pink and copper creature leaping from the river. If you had been trying to capture him you might have missed the impact of his gaze. Thats so true Cara, perhaps that moment was best caught with my mind rather than my camera! What a glorious autumn we’ve been having….the light has been beautiful. What a thrill to watch these salmon do what they have done since ancient times, driven by their ancestral memory. Loved your poetic storytelling! Some very quick reactions on the shutter! 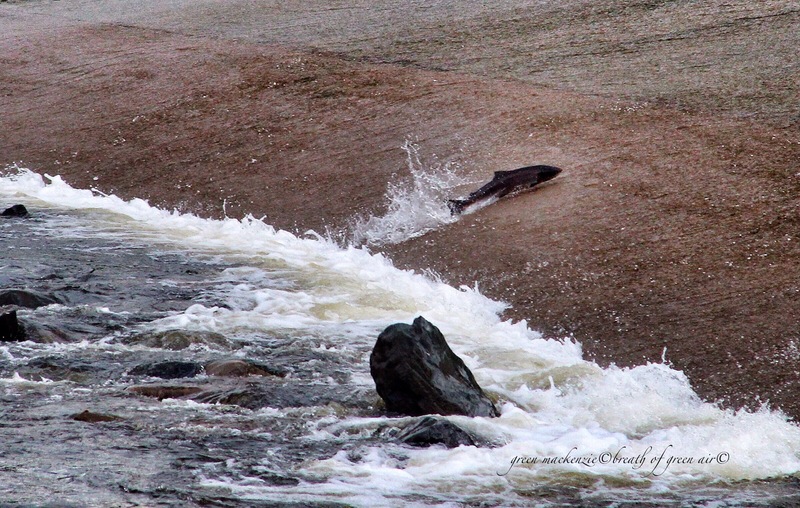 We get the same show as the salmon negotiate the weir beneath Hexham road bridge but they are such fleeting appearances I haven’t tried to capture them – your post will prompt me to give it a go. Excellent words and images as ever and thanks for the inspiration. That must have been amazing to see. There are so many dams in the USA that a sight like that is beyond rare. In places where old dams have been removed, however, the salmon quickly return. I hope we can see more progress of dam removal in coming years to help restore the salmon as well as other former fish of our previously wild flowing rivers. Its such a shame to loose the salmon because of pur needs for power. 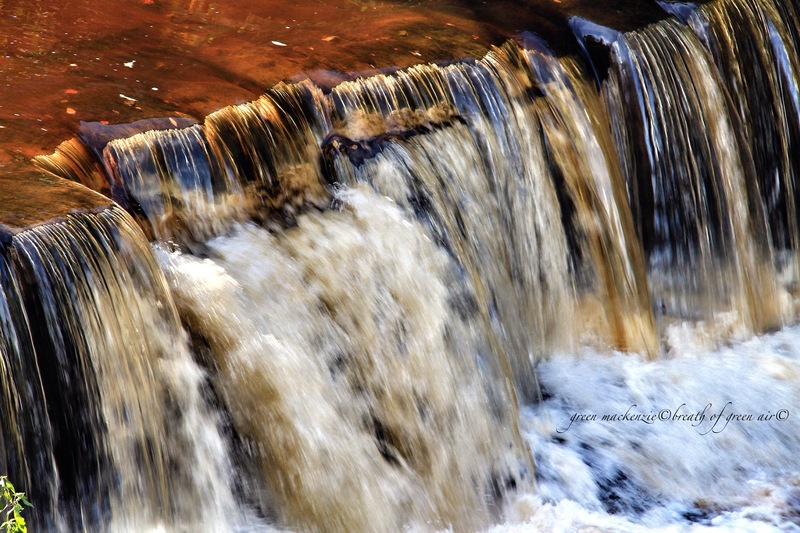 Lots of our rivers had weirs…sort of like dams…built in to run mills 100 or so years ago. Lots of the weirs are still there like the one you see the salmon leaping up, but they have had fish ladders built to help the fish climb! We have many fish ladders on our dams as well, but they do little to reduce the impact, unfortunately. Time will tell! ‘The sunlight spun into threads…’ Such evocative, elegant sentences. You make me feel I was there with you. Your words and images are not just simply beautiful, I feel the will and the strength of the salmon. Mindfulness personified perhaps? 🙂 Thank you for a lovely post. an amazing read, was like experiencing it oneself. The teaching of the salmon, love it! Traditionally in Scotland they are called the salmon of wisdom, holding the answers to everything….and considered far older than man! Delighted my love and awe of these creatures came through in the post Hanne. I’ve read about it in Celtic lore and I’m always fascinated by how we can learn so much from listen and observe nature. What an amazing sight – strangely enough I came on line to post images of a waterfall too. We don’t get salmon leaping up the falls here but for a couple of weeks in the summer it is possible to see eels crawling up the falls on their way to their breeding grounds. What amazing captures Seonaid. Its incredible that they make it up river against such physical odds, but its the ancestral memories that bring them home that I find most fascinating. We are lucky, but you have some lovely natural beauty around your new home…..im thinking of that lovely river bend right outside your windows. How is the renovation coming along? What an amazing thing to see and I love the shot of the salmon! A really great lesson to learn from the salmon. Thank you. Its a great sight, which gets me excited to watch it every year. As Sarah commented earlier you end up cheering them on, willing them to make it up and over on their next attempt! Fascinating captures of the light, water, and salmon! What a view from your backyard, Seonaid! Wonderful photos!The return of the salmon is an event of pure magic. Thank you! Its one if my favorite things about autumn….as you say pure magic. It would be a great place to spot the salmon….I get so excited when one jumps, it’s somehow such a thrill! Oh I loved those photos! I remember not being able to explore the area well because of my mobility issues. I didn’t have my electric wheelchair with me but I’m not sure if the pathways would be suitable. It’s a place I desperately want to visit again! The whole family was utterly entranced watching the salmon, it really is exciting, you hold your breath waiting to see if they make it. Awesome 🙂 I really must get back up to Perthshire sometime. I just loved it! As always I love your fascinating and colorful photography. I think that salmon was working to escape you as well as the heron. Here in the NW, I live on an inlet and watching the salmon spawn is like watching corn pop out of the basket. The fish fly all over the place as fisherman attempt to lure them into their boats. Sadly, the fly fisherman would do better using butterfly nets so they could swoop the fish out of the air as they leap out of the water. The salmon here dodge eagles, osprey, heron, and seagulls. Thank you for your fabulous pictures and descriptive wording. The difference between Washington State and Scotland is the wealth of history. Compared to your country we are still in the infant stage. However, if you were on the coast, in the mountains, or hiking up along side a stream I think there would be few differences. Nature wise, we are the same age. Go to my blog, in the A – Z section and look at “W.” You will see a couple pictures of Poulsbo and “NO” I didn’t take the pictures, unfortunately. So true, and I guess thats what I sense when reading your comments and your blog…..same nature different history! Oh, this was lovely! Your verse is beautifully written; I especially love the lines, ‘the sunlight spun into threads/ by the long wet fingers of the river.’ Divine!